When it comes to Auger Drills there are many types that come in a variety of sizes, each one for a specific task. Some can be used to dig holes to put posts for a fence or a deck. In some cases, they can even be used to create bigger holes to plant small trees in someone’s property. But the more useful purpose comes from boring holes in potential dig sites. This tool can be modified in ways that can increase their drilling ratio. It is why drilling companies in Queensland use auger drilling. It is has a gas-powered, hydraulic system that connects to a drive shaft and from there to a drill bit. Auger drilling is essential for companies that are constantly digging holes in the Earth. It’s both cost effective and time saving but most importantly, it won’t break your back literally from trying to dig that hole yourself. Some auger drills are small enough that they can be operated by one person. In some cases, two might be needed. These drills are better suited for smaller jobs. 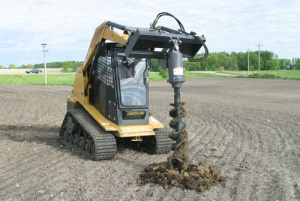 Of course, there are auger drills that can be equipped on larger support vehicles such as front-end loaders or tractors. It’s important to know which type of auger you’ll need in order to complete the job in the time-allotted. Once you’ve chosen the right drill, you’ll need to choose the appropriate power head. If you’re looking to make a smaller hole than a high speed power head is best for you. This will work best on softer ground. If you need to use a larger bit for a larger hole then you’ll need a high-torque power head. That’s because the high-torque is able to break through a surface that is harder. You’ll also have to choose between using a planetary power head, which offers higher torque and speed and is compact, or a the chain driven power head which works well for just about any drilling job but is considered a far less expensive alternative. Auger bits can range anywhere from 6 to 30 inches in width. So it’s really up to the operator and of course, the size of the hole that needs to be dug. Once the width of the auger bits are figured out then the next order of business is the length. The length of the bit can be augmented with extensions to reach the desired depth. The lengths extensions are essential because it allows the user or users to make length adjustments before or in between drilling. The only thing to keep in mind is that you should buy an auger drill and all of its respective equipment from a reliable manufacturing company. Otherwise you run the risk of going to a drilling site with an auger drill that is not equipped to handle the job. This will end up costing you and the drilling company money if the equipment breaks down. Becoming familiar with the ins and outs of the auger drill ensures that the drilling project gets done right.